In the era of open source software development platform like GitHub and Bitbucket, developers love to use already built-in open source solutions rather than developing their own. Recently for a custom Laravel based CRM project (which I am developing for a Fin-Tech startup), I needed the dynamic PDF generation feature for the customer’s leads table so they could easily print the basic lead information on pdf. After googling for sometime, I stumbled upon a very nice DOMPDF Wrapper for Laravel at GitHub, laravel-dompdf. Here I am going to share how can you easily install that package and generate your PDF with dynamic data and in very nice formatting. I bet you, its easy !! I have made it very simple and step by step. Let’s start. I am assuming you already have a Laravel project setup on your machine either its fresh installation or you want to add the dompdf package to your existing Laravel application. You got it now, Right? So we don’t have to worry about that package which has some magical files and code inside it but one thing is for sure it will solve our problem quicker than you might think. FYI, there is a huge packages database at https://packagist.org/ which you can browse and use. 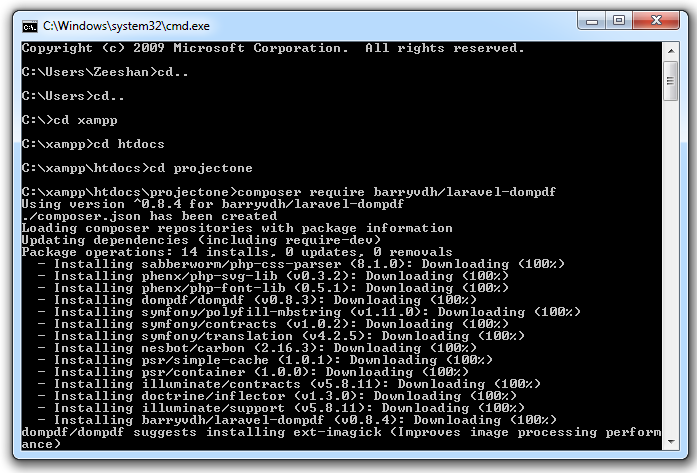 To install a package you need to first have Composer on your machine. A Composer is a package manager which is used to download and install packages to our projects. Its not difficult, just download file from https://getcomposer.org/download/ and install it. Open the Command interface, I am using Windows, So press WinKey+R and in run dialogue box, type cmd, hit Enter. By default we are into User directory, Let’s move to where our project is installed. Type cd.. and hit Enter. 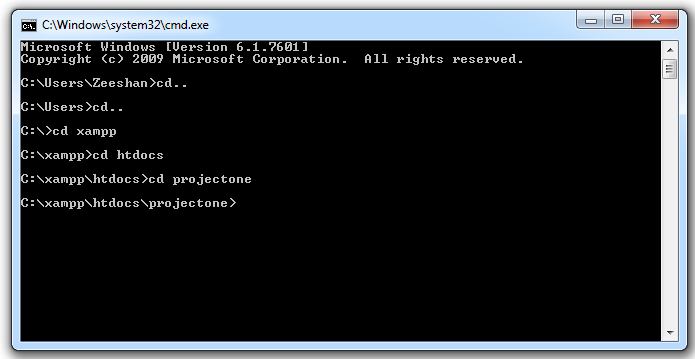 Now let’s move to our project directory, mine is projectone where I want to install the package. 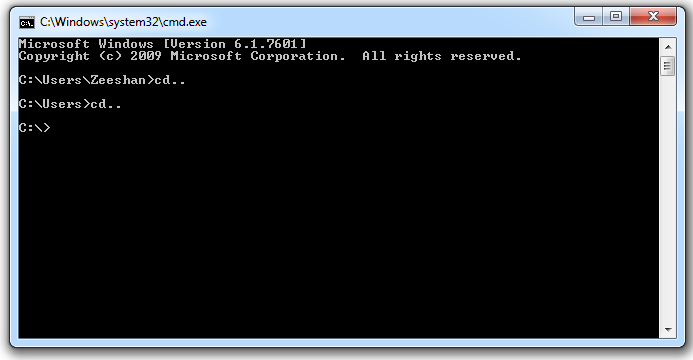 Wait for the installation until you see the cursor start blinking again at the end of the command interface. In above, you see I have a function in PrintPDF in Customer controller which will handle the PDF generation. Now add that route to any anchor or button you want to use for PDF generation. Create new controller in (app\Http\Controllers\) and paste the following code. // This is important to add here. You can add the above function printPDF() into any of your existing controller or you can create new one with any other name (I am using Customer controller as example in this post). But make sure if you have different controller name then you should update above route lines (Step 3) accordingly. A blade view is something which will be rendered to our final PDF. That’s it. You are done. Now hit the button to generate your PDF. To apply formatting on a PDF you need to add inline css to the elements and to make the elements fit to the PDF use HTML tables instead Div, Span or other markups tags. Don’t forget to give table 100% width if you want to create PDF with edge to edge layout. I hope this example has made your work easier. I really enjoyed writing my almost first post here on Medium. You can follow my articles over my blog 99Points.info or on add me on LinkedIn.